Fermacell is the company which has been producing high quality construction products for more than 40 years. It offers a wide range of materials depending on the condition of the premises and its purpose. For example, Fermacell Powerpanel moisture resistant boards for wet premises and exterior walls, as well as Fermacell Aestuver fire resistant boards for fire-hazardous ones. Fermacell gypsum fibreboard is a special homogeneous by the structure material which is used for finishing of surfaces and is made of natural raw - building gypsum and recycled paper fibers. Additional connecting elements are not included. Their manufacturing process is carried out with strict quality control according to world environmental standards. They are particular recommended to be used in damp and fire-hazardous premises due to the material composition. Fermacell gypsum fibreboard looks similar to plasterboard, but consist of crushed paper and it is plastered on the outside. Used for finishing walls, floors and ceilings of public and residential buildings, as well as for other structures processing. Excellent for flooring substrates and dry floor screed. It is used not only for walls, floors and ceilings fire protection, but also in areas with high humidity, for example, external walls and pools. Density. High structure viscosity of the material provides a minimum amount of waste during the sawing, as well as the ease of screwing without dowels using. Resistant to wear-out material. Air permeability. Due to the lack of glue in their composition, the air permeability of the structure increases and the possibility of gas evolution is eliminated. Ecological compatibility. 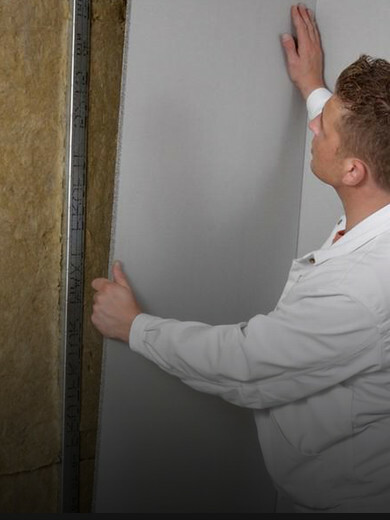 Fermacell gypsum fiberboard manufacture meets world environmental quality standards. It doesn’t contain harmful to the environment and human health materials and synthetic components. High strength. Due to their high strength, they are stable and resistant to mechanical stress. Due to a homogeneous and uniform structure, as well as fiber reinforcement. Fire resistance. Recommended for fire-hazardous premises. Since the gypsum fiberboard doesn’t burn, it is therefore suitable as a protection for wooden structures and various communications from the fire. Sound insulation. Can reduce the noise level depending on the board thickness, so it is used for sound insulation of premises. Transcalency. Has a low level of thermal conductivity, so it is also used as a thermal insulation material. Moisture resistance. Fermacell boards are covered with a water repellent during the manufacturing process. Both types of the boards have the same size and look similar. Both materials are environmentally friendly and don’t harm the natural environment, people life and health. They are significantly different in properties and characteristics. Gypsum fibreboard compared with plasterboard has better sound insulation, fire and moisture resistance, and also has a higher resistance to mechanical influences.